Histories of the National Mall | "Facts About the Monument"
“"Facts About the Monument" ,” Histories of the National Mall, accessed April 25, 2019, http://mallhistory.org/items/show/282. This Washington Post article from February 22, 1885 discusses the features of the newly completed Washington Monument. 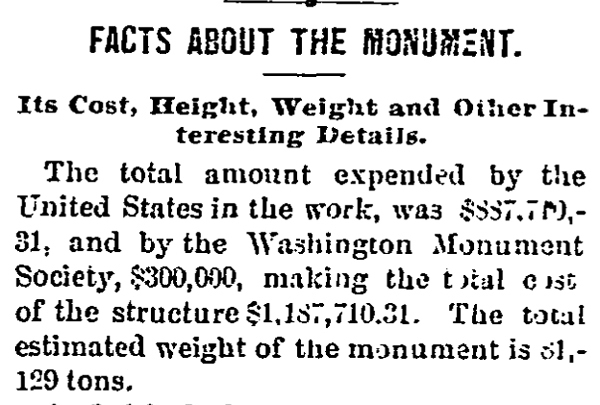 Including facts about height, weight, and marble used, the article shows the enthusiasm Americans felt that the monument was finally being completed after more than 20 years under construction. FACTS ABOUT THE MONUMENT. Its Cost, Height, Weight and Other Interesting Details. The total amount expended by the United States in the work, was $887,710.31, and by the Washington Monument Society, $300,000, making the total cost of the structures $1,187,710.31. The total estimated weight of the monument is 81,129 tons.